Coffee/tea mugs made of porcelain. The price includes printing of a photo/logo or text inside the selected frame. We ship worldwide with tracking number. Personalized Flowers mug, make a unique gift with our custom printed coffee/tea mugs. This custom Flowers mug is made of quality porcelain and can be a great keepsake to your friends and families. Please do not forget when making the purchase to provide us with the photo you wish to be printed. 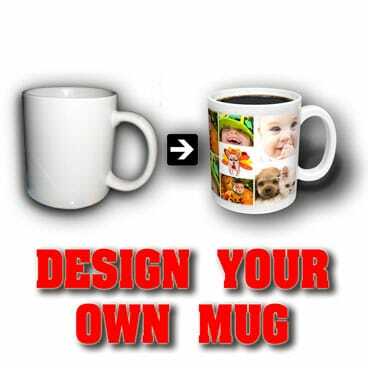 To start personalizing your custom printed mug, please press the button “Customize”. Once inside the product designer you can add picture or text, or both from the menu on the right side of the screen. To add a picture click or drop an image in the rectangle field on your right. When your picture is uploaded, adjust the size, by using the arrows located on the bottom right corner of your picture. Move them until your picture fits inside the frame. You can adjust what you want to see (just faces or the hole bodies), by zooming in and out. Once you have centered your photo, you can add text by pressing the second icon on the right side of the screen, it is the big “A” icon. When pressed a new rectangular field will appear, where you can type your text. After adding your text click on it and select from the new menu window bellow what color and style you want. Then use the arrows on the right bottom corner to zoom in or out, click on the middle of the text if you want to move it and centered it. Once ready with your customization, press the button “Done” located on the bottom left corner. This will close the product designer and will return you in the product page. Here you can add a comment regarding your order.